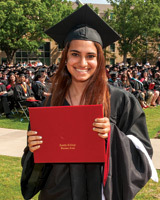 Austin College’s Commencement ceremony May 19 was full of celebrations and reminiscences for the Class of 2013, anticipating future goals and recalling shared moments. Austin College President Marjorie Hass happily presented diplomas to more than 360 graduates as Mike Imhoff, vice president for Academic Affairs, announced each name. Dr. Hass also awarded honorary doctoral degrees to Carolyn Hessler-Radelet, deputy director of the Peace Corps, who delivered the Commencement address; the Reverend Alfred W. Morgan ’67, retired Presbyterian minister, who presented the Baccalaureate sermon; and Jerome Fullinwider, Dallas businessman and leader in oil and gas development. The Commencement speaker was introduced by Helen Lowman ’88, regional director for the Peace Corps Europe, Mediterranean, and Asia region. Catherine Stodola ’13 spoke on behalf of her fellow graduates. Not to be outdone in the area of celebration, members of the Class of 1963 were on campus for their 50th-year reunion. Each year, the faculty selects two outstanding students in the graduating class for special recognition by the Board of Trustees, based upon students’ entire academic record and course distribution, cumulative grade point average, and credits earned. The two students, with no distinction between them, receive the J.C. Kidd and J.M. Robinson Memorial Scholarship Medals, first presented in 1940 and 1935, respectively. Bethanie Livernois received the Kidd Medal and Carina Parikh received the Robinson Medal. Bethanie completed majors in history and political science and a minor in leadership studies. She was inducted to Phi Alpha Theta and Pi Sigma Alpha national history and political science honor societies, as well as Alpha Chi and Phi Beta Kappa national honor societies. She was a member of the Posey Leadership Institute and participated in Model United Nations competitions. She studied internationally through January Term courses: “Turkey: Layers of History,” that included exploration of ancient and modern cultural and political life; and “Exploration of Democracy,” with study in Washington, D.C.; London, England; and Valletta, Malta. Bethanie also was active in many campus organizations, including Rotaract, which she served as president for two years, and Mentors in Violence Prevention. She worked as a College tour guide and was selected as a Hatton W. Sumners Scholar and an intern in the Johnson Center for Faculty Development. She also was a children’s church leader at First United Methodist Church and worked for the Montessori Academy of North Texas. She also interned with Texas State Representative Allen Vaught and with Grayson County Court Appointed Special Advocates (CASA). Completing majors in psychology and mathematics, Carina was involved in research in biopsychology and completed an honors thesis in psychology. She has participated in several summer internships, in work ranging from an after-school program for children with behavioral issues to an analyst for Avelo Mortgage, and then with a zoologist in his lab at Oklahoma State University. She also found time for activities beyond the academic—competing as a member of the cross country team and participating in Delta Phi Nu sorority—and managed to fit in a January Term international study experience in France. She also was inducted as a member of Psi Chi national honor society in psychology and both Alpha Chi and Phi Beta Kappa national honor societies. She plans to conduct research this fall at the National College of Natural Medicine, examining functional medicine in a nutrition lab. She then will continue study to earn a Doctor of Naturopathic Medicine degree and start a private practice or open a clinic. Much of her interest had origins in her biopsychology course, which she found her most interesting class. “The class helped me find my passion for research and neuroscience and led to my work in the biopsychology lab, which opened many doors for me,” she said. 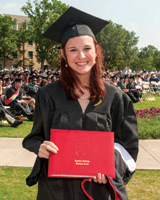 See the Commencement 2013 photo spread and find many more photos on the Austin College website.